This name uses Eastern Slavic naming customs; the patronymic is Maximilianovich and the family name is Malenkov. Georgy Maximilianovich Malenkov[a] (8 January 1902 [O.S. 26 December 1901] – 14 January 1988) was a Soviet politician who briefly succeeded Joseph Stalin as the leader of the Soviet Union. However, at the insistence of the rest of the Presidium, he relinquished control over the party in exchange for remaining first among equals as the country's Premier. Subsequently, Malenkov became embroiled in a power struggle ultimately culminating in his removal from the premiership in 1955 and the Presidium in 1957. Throughout his political career, Georgy Malenkov's personal connections with Vladimir Lenin significantly facilitated his ascent within the ruling Communist Party of the Soviet Union. By 1925, he was entrusted with overseeing the party's records. This brought him into contact with Stalin who had by then successfully consolidated power as General Secretary of the Communist Party of the Soviet Union to become the de facto leader of the Soviet Union. 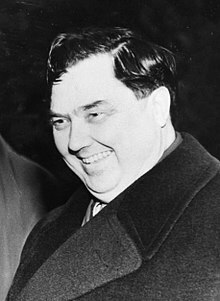 As a result of this association, Malenkov became heavily involved in Stalin's purges before later being given sole responsibility over the Soviet missile program during World War II. From 1946 to 1947, he chaired the Council of Ministers Special Committee on rocket technology [ru]. In order to secure his position as Stalin's favorite, he successfully discredited Marshal Georgy Zhukov and suppressed all glory associated with Leningrad during World War II so that Moscow maintained its image as the Soviet Union's sole cultural and political capital. Following Stalin's death on 5 March 1953, Malenkov temporarily emerged as the Soviet dictator's undisputed successor by replacing him as both Chairman of the Council of Ministers (or Premier) and the highest-ranking member of the party's Secretariat. However, only nine days later, the Politburo (then known as the Presidium) forced him to give up his membership in the party apparatus while allowing him to retain the premiership. Henceforth, Malenkov presided over a collective leadership until being removed as Premier in 1955 by the party’s First Secretary, Nikita Khrushchev. After later organizing a failed coup against Khrushchev in 1957, he was expelled from the Presidium and exiled to Kazakhstan in 1957, before ultimately being expelled from the Party altogether in November 1961. He officially retired from politics shortly afterwards. After a short sojourn in Kazakhstan, he returned to Moscow and kept a low profile for the remainder of his life. Malenkov was born at Orenburg in the Russian Empire. His paternal ancestors were from the area of Ohrid in the Ottoman Vilayet of Manastir, (present day North Macedonia). Some of them served as officers in the Russian Imperial Army. His father was a wealthy farmer in Orenburg province. Young Malenkov occasionally helped his father to do business selling the harvest. His mother was the daughter of a blacksmith and the granddaughter of an Orthodox priest. In 1920, in Turkestan, Malenkov started living together with Valeria Golubtsova, daughter of Aleksei Golubtsov, former State Councilor of the Russian Empire in Nizhny Novgorod and dean of the Imperial Cadet School. Golubtsova and Malenkov never officially registered their union and remained unregistered partners for the rest of their lives. Golubtsova joined the Soviet Communist Party in 1920; her personal views were described as anti-semitic by her co-workers. She had a direct connection to Vladimir Lenin through her mother — one of the "Nevzorov sisters" who were apprentices of Lenin and studied together with him for years, long before the Revolution. This connection helped both Golubtsova and Malenkov in their communist career. Later Golubtsova was the director of the Moscow Energy Institute, a center for nuclear power research in USSR. Malenkov was in charge of keeping records on the members of the Soviet communist party – two million files were made under his supervision during the next ten years. In this work Malenkov became closely associated with Stalin and was later heavily involved in the treason trials during the purging of the party. In 1938, he was one of the key figures in bringing about the downfall of Yezhov, the head of the NKVD. 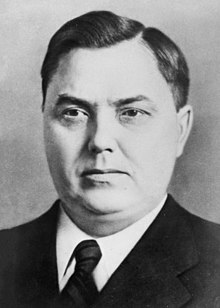 In 1939, Malenkov became the head of the Communist party's Cadres Directorate, which gave him control over personnel matters of party bureaucracy. During the same year, he also became a member and a Secretary of the Central Committee and rose from his previous staff position to full member of the Orgburo. In February 1941, Malenkov became a candidate member of the Politburo. After the German invasion of June 1941, Malenkov was promoted to the State Defense Committee (SDC), along with NKVD chief Beria, Voroshilov and Molotov with Stalin as the committee's head. This small group held total control over all political and economic life in the country and Malenkov's membership thus made him one of the top five most powerful men in the Soviet Union during World War II. Between 1941 and 1943, Malenkov's primary responsibility in the GKO was supervising military aircraft production as well as supervising the development of nuclear weapons. In 1943, he also became chairman of a committee that oversaw the post-war economic rehabilitation of some liberated areas with the exception of Leningrad. "Zhdanovshchina" was the emphasis on purified communist ideology developed during the Second World War by Andrei Zhdanov. It emerged from Zhdanov's debates inside the party hierarchy opposing Malenkov's pragmatist faction. Malenkov stressed the universal values of science and engineering, and proposed to promote the technological experts to the highest positions in the Soviet administrative elite. Zhdanov's faction said proper ideology trumped science and called for prioritizing political education and ideological purity. However the technocrats had proven amazingly successful during the war in terms of engineering, industrial production, and the development of advanced munitions. Zhdanov's sought to use the ideological purification of the party as a vehicle to restore the Kremlin's political control over the provinces and the technocrats. He worried that that the provincial party bosses and the heads of the economic ministries had achieved too a high degree of autonomy during the war, when the top leadership realized the urgent need for maximum mobilization of human and material resources. The highest priority in the postwar era was physical reconstruction after the massive wartime destruction. The same argument that strengthened the technocrats continue to operate, and the united opposition of Malenkov, the technocrats, the provincial party bosses, and the key ministries doomed Zhdanov's proposals. He therefore pivoted to devote Zhdanovshchina to purification of the arts and culture. Georgy Zhukov was the most prominent Soviet military commander during World War II, winning several critical battles, such as the Siege of Leningrad, the Battle of Stalingrad, and Battle of Berlin. Stalin, Beria and Malenkov grew suspicious of Zhukov, worrying he possessed capitalistic tendencies, because Zhukov established a friendship with General Dwight D. Eisenhower, invited the future American president to Leningrad and Moscow, and endorsed collaboration between the United States and the Soviet Union. At the conclusion of World War II and shortly thereafter, Malenkov sided against several who were considered Soviet war heroes, among them Zhukov, Rokossovsky and several other popular generals. Malenkov's accusations against Zhukov were mostly based upon allegations of counter-revolutionary behavior and selfish "Bonapartism." Soon Zhukov was demoted in rank and moved to a lower position in Odessa where his only foes were local Party forces. Zhukov had his first heart attack not long after, and Malenkov's concerns of him had largely faded. After the ruthless attack on Zhukov, Malenkov gained strength and became closer with Stalin and several other top communists. In 1946 Malenkov was named a candidate member of the Politburo. Although Malenkov was temporarily trailing behind his rivals Andrei Zhdanov and Lavrentiy Beria, he soon came back into Joseph Stalin's favour, especially after Zhdanov's mysterious death in 1948. That same year, Malenkov became a Secretary of the Central Committee. During the late 1940s and early 1950s Malenkov gained more favor with Stalin than any other top Soviet communist. Malenkov's main competition were the leaders of Leningrad whose glory had been earned in resistance to Hitler's attacks during World War II. After the Siege of Leningrad the Mayor Kuznetsov and his deputies earned much fame and support all over the USSR. Malenkov followed Stalin's policy of suppressing that glory in order to maintain Moscow's image as the USSR's only center of power. In 1949, Malenkov personally came to Leningrad leading a regiment of armed men from Moscow MGB special forces and swiftly removed and arrested the city leaders. After a series of secret trials, 23 men, including the Mayor and deputies, were executed and buried in unmarked pit on the outskirts of the city. At the same time, over two thousand top managers and intellectuals were uprooted and exiled from Leningrad to Siberia, their property was confiscated, and their positions were filled by communists loyal to Stalin. During the same years, Malenkov also exterminated the Jewish Anti-Fascist Committee. Many members of the Jewish Anti-Fascist Committee were killed in the Night of the Murdered Poets. On August 12, 1952, thirteen Jewish writers were executed by gunshots in the basement of Lubyanka Prison. The antisemitic pogrom was approved by Stalin and supervised by Malenkov. Malenkov's loyalty to Stalin was proven by executions of political competition and the Leningrad affair and catapulted Malenkov to become the only successor of Stalin. Malenkov was forced to resign in February 1955 after he came under attack for abuse of power and his close connection to Beria (who had been executed as a traitor in December 1953). He was held responsible for the slow pace of reforms, particularly when it came to rehabilitating political prisoners. However, in 1957, Malenkov organized an attempt at a coup against Khrushchev. In a dramatic standoff in the Kremlin, Malenkov was turned on by both Khrushchev and Zhukov, who had the support of the Soviet armed forces. Malenkov's attempt failed and he, together with co-conspirators Vyacheslav Molotov and Lazar Kaganovich, who were characterised by Khrushchev at an extraordinary session of the Party Central Committee as the 'Anti-Party Group', were swiftly fired from the Politburo. In 1961, Malenkov was expelled from the Communist Party and exiled to a remote province of the Soviet Union. He became a manager of a hydroelectric plant in Ust'-Kamenogorsk, Kazakhstan. After his exile from the Party, Malenkov fell into obscurity and suffered from depression due to loss of power and the quality of life in a poor province. However, some researchers say that later Malenkov found this demotion and exile a relief from the pressures of the Kremlin power struggle. Malenkov in his later years converted to Russian Orthodoxy, as did his daughter, who has since spent part of her personal wealth building two churches in rural locations. Orthodox Church publications at the time of Malenkov's death said he had been a reader (the lowest level of Russian Orthodox clergy) and a choir singer in his final years. He died on 14 January 1988 at age 86. In 1920, Malenkov married a famous soviet scientist Valeriya A. Golubtsova (15 May 1901 – 1 October 1987) and had two sons and one daughter, Volya Shamberg (9 September 1924 – 2010), Andrei (born 29 May 1937) and Georgiy (born 20 October 1938). The 1952 Time magazine cover shows Malenkov embraced by Stalin. Time magazine illustrates that Malenkov was Stalin's apprentice and successor. In 1954, a delegation of the British Labour Party (including former Prime Minister Clement Attlee and former Secretary of State for Health Aneurin Bevan) was in Moscow. Sir William Goodenough Hayter, British Ambassador to the Soviet Union, asked for a meeting with Nikita Khrushchev, then General Secretary of the Communist Party of the Soviet Union. Much to Hayter's surprise, not only did Khrushchev accept the proposal, but he decided to attend in the company of Vyacheslav Molotov, Anastas Mikoyan, Andrey Vyshinsky, Nikolay Shvernik, and Malenkov. Such was the interest aroused in British political circles by this event that Sir Winston Churchill subsequently invited Sir William Hayter down to Chartwell so as to provide a full account of what had transpired at the meeting. Malenkov seemed "easily the most intelligent and quickest to grasp what was being said" and said "no more than he wanted to say". He was considered an "extremely agreeable neighbour at the table" and was thought to have had a "pleasant, musical voice and spoke well-educated Russian". Malenkov even recommended, quietly, that British diplomatic translator Cecil Parrott should read the novels of Leonid Andreyev, an author whose literature was at that time labelled as decadent in the USSR. Nikita Khrushchev, by contrast, struck Hayter as being "rumbustious, impetuous, loquacious, free-wheeling, and alarmingly ignorant of foreign affairs". Hayter observed that he "spoke in short sentences, in an emphatic voice and with great conviction.....grinning good-naturedly", that he often "stumbled in his choice of words" and "said the wrong thing." Hayter thought that Khrushchev seemed "incapable of grasping Bevan's line of thought", and that Malenkov had to explain matters to him in "words of one syllable". Given to "interrupting," he (Khrushchev) seemed more eager to talk than to listen and to understand. He was "quick, but not intelligent". Convinced that Malenkov was in charge, nobody in the British delegation felt much inclined to expend effort with Khrushchev. Malenkov "spoke the best Russian of any Soviet leader I have heard", his "speeches were well constructed and logical in their development", and he seemed "a man with a more Western-oriented mind." Jeffrey Tambor played Malenkov in the 2017 satirical film The Death of Stalin .in which Malenkov is portrayed as naive and slow - contrary to reports mentioned herein of British diplomats. ^ Frankel, Benjamin (6 March 1992). "The Cold War, 1945-1991: Leaders and other important figures in the Soviet Union, Eastern Europe, China, and the Third World". Gale Research – via Google Books. ^ a b c "BBC - History - World Wars: Stalin and the Betrayal of Leningrad". www.bbc.co.uk. ^ Мікалай Аляксандравіч Зяньковіч; Николай Зенькович (2005). Самые секретные родственники. ОЛМА Медиа Групп. pp. 248–249. ISBN 978-5-94850-408-7. ^ Jonathan Haslam (2011). Russia's Cold War: From the October Revolution to the Fall of the Wall. Yale University Press. pp. 136–. ISBN 978-0-300-15997-4. ^ a b V.M. Zubok and K. Pleshakov (1996) Inside the Kremlin's cold war: from Stalin to Khrushchev, Harvard University Press, ISBN 0674455320, p. 140: "His ancestors were czarist military officers of Macedonian extraction." ^ "Kusnetsova, Raisa. Stranitsy is "Povesti zhizni." Moscow, 1994" (PDF). ^ Bazhanov, Boris (1980). Stalin's secretary memoirs. Paris, 1980. ^ Nikolaevsky, Boris, Felshtinsky, Yuri (1995). Malenkov's biography from "Secret pages of history." Moscow. ^ a b c d e f g h Paxton, J. (2004) Leaders of Russia and the Soviet Union: from the Romanov dynasty to Vladimir Putin, CRC Press, ISBN 1579581323, pp. 113–114. ^ Daniel Stotland, "A More Perfect Union." Soviet & Post-Soviet Review (2014) 41#2 pp 121-145. ^ Talya Zax (12 August 2017). "65 Years Ago, The USSR Murdered Its Greatest Jewish Poets. What's Left Of Their Legacy?". The Forward. Retrieved 12 August 2017. ...they...were executed in the [Lubyanka Prison]'s basement. ^ Time magazine 1952, 1953 cover and editorials. ^ "Soviet Union - History, Leaders, Map, & Facts". ^ Johanna Granville (1995) "Soviet Documents on the Hungarian Revolution, 24 October – 4 November 1956", Cold War International History Project Bulletin, no. 5 (Woodrow Wilson Center for International Scholars, Washington, DC), Spring, pp. 22–23, 29–34. ^ RUSSIA: The Quick & the Dead. TIME (22 July 1957). Retrieved on 22 April 2011. ^ a b c OBITUARIES Sir William Hayter – People, News. The Independent. 30 March 1999. ^ "The Death of Stalin".